The red carpet event at the Oscars, Hollywood's preeminent see-and-be-seen affair, is as much about celebrity pageantry as it is a chance for stylists to make their mark. Each year, designers prepare by studying successful looks from seasons past, searching for a gown that will inspire other designers for years to come. Though similarities between classic looks are often coincidential, the references can be strategic, too. Jeffrey Monteiro, a fashion expert and former design director at such houses as Derek Lam and Bill Blass, explains that celebrity stylists and handlers borrow from one another "to place themselves [and actresses] in the Hollywood hierarchy," choosing particular dresses to announce a transformation in a star's career, or even to set the tone for an era of fashion. Monteiro has hand-picked some of the most iconic dresses in Oscar history — e.g., Grace Kelly's classic green gown, Lauren Hutton's 1975 Halston — and the frocks they would inspire years later. But a gown doesn't make the complete look: Though the differences between these styles may be subtle, one celebrity truly owns the look. View the gallery below and tell us: Who do you think wore it better? 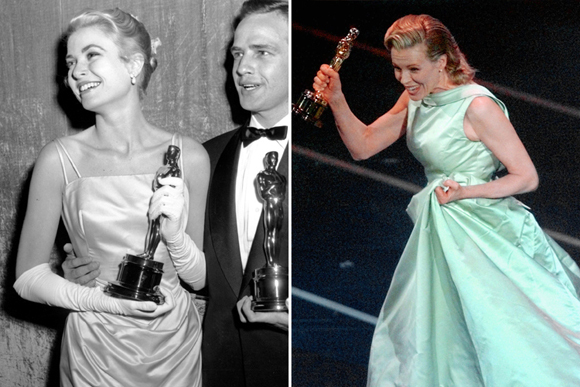 Grace Kelly won an Oscar for her role in "The Country Girl," wearing an Edith Head dress, reportedly the most expensive dress in Academy Awards ceremony history. It also heralded the era of the ceremony becoming a fashion spectacle. Kim Basinger wore a dress very reminiscent of Grace Kelly's both in color and design the year she won the Oscar for her role in "LA Confidential," playing a girl from a country town run aground in seedy shadows of 1950s Los Angeles. Basinger's dress was by the German fashion house Escada. Basinger was perhaps channeling Kelly's sweetheart tag. Nicole Kidman reveals her softer feminine side in 2002 in a nostalgic feathery-light layered dress. She said, "I wanted something light and airy," and indeed her Chanel haute couture dress exudes that. Kidman is at the ceremony with her first nomination, for "Moulin Rouge," looking more delicate than the character she portrayed in the film. Diane Kruger, at the awards to present, adheres to her predilection for feminine lace in 2006, here with a light delicate touch, in a white, frilly lace Elie Saab gown. Saab is known for romantic couture-like delicate dresses that are as flattering as they are beautifully constructed, designed with a high price tag. Both starlets project a similar attitude, each from their own vantage point. Nicole Kidman is Hollywood establishment showing her style and stature in a striking sheath with couture-like bow at the neck. Emma Stone, Hollywood's latest ingénue looking to fast-track it to the A-list with her interpretation in a dress of similar color and design details. Kidman wears a custom-designed Balenciaga by Nicolas Ghesquire gown. It has certain Balenciaga signatures like the oversize sculpted neck bow, but is very much designed for the publicity opportunity that is the Oscars red carpet. Stone wore Giambattista Valli from the spring 2012 Haute Couture Collection that was straight from the runway. Keira Knightley's dress was highly regarded in the style ranks, although it seems like a dress more suited in style, color and fabrication to a more mature actress rather than a 21-year-old burgeoning starlet. Her garnet-colored taffeta gown was custom designed by the former American Vogue editor turned designer Vera Wang, who is best known for her bridal line. Penelope Cruz may be of a more appropriate age to carry the style — her dress is designed by Donna Karan — but it warrants the question if the silhouette in those proportions was worth revisiting. Elizabeth Taylor's confident choice of cornflower blue silk by the legendary Hollywood designer and costumer Edith Head. The dress highlights the luminosity of Taylor's skin and eyes and the Cartier pear-shaped diamond necklace she wore. The necklace was a gift from husband Richard Burton. The 69-carat diamond later came to be known as Taylor-Burton diamond. The complete look spotlights her eminent place on the Hollywood A-list even at a time when she was losing favor as a box-office draw and began to step away from the spotlight. Mila Kunis is wearing a dress in a similar shade of cornflower by French couture house Elie Saab, a perennial red carpet choice of Hollywood actresses. The delicate lace and chiffon combination has a balletic grace as lithe and assured as her performance in "Black Swan," which was nominated for best film that year. Winslet's dress, by Ben de Lisi, who was known for designing many of her red-carpet dresses, was a resounding hit: beautiful, stately and memorable. 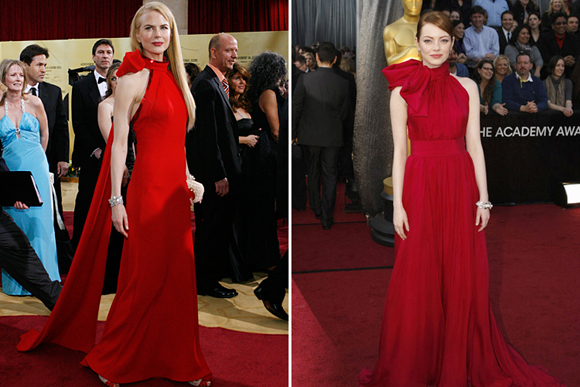 The deep red dress with its fabric floral drape over one shoulder has been largely imitated. Anne Hathaway takes style cues from Winslet's version in 2008 with slight belle époque references. 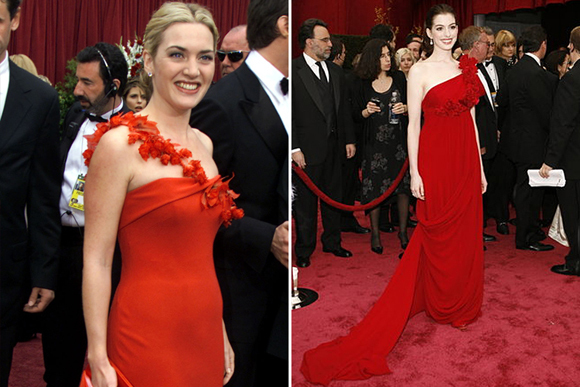 Her chiffon dress of similar color and details to the one worn by Winslet is by the special occasion label Marchesa. It's interesting to note that one of the designers behind the label is married to Harvey Weinstein, giving the designer VIP access to many of Hollywood's A-list stars. Mia Farrow breaks away from her usual style in her plunging halter gown with a bead embellishment at the bustline, which has that '70s flair with a hint of '40s glamour. The low V neckline is a template for a type of dramatic sexiness that has reemerged in red carpet gowns throughout many eras, from the '30s through today, usually with favorable results. 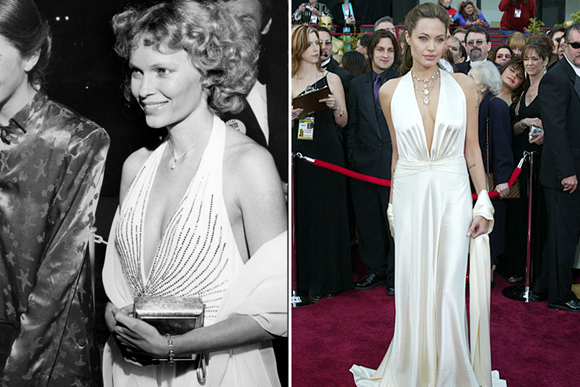 As is the case nearly 30 years later: Angelina Jolie stakes her glamour quotient in a slinky halter gown by Marc Bouwer. The gown has the same neckline as Farrow's; the style was a break from Jolie's previous looks on the red carpet, which tended to be darker and more gothic in sensibility (though she retains some of that tough girl chic with her tattoo on display). Unconventional fish-scale texture in a T-shirt-style dress works for Huston in subtle ways, whereas Cotillard wears a gown with a similar pattern to bolder effect. Both display their inimitable style. 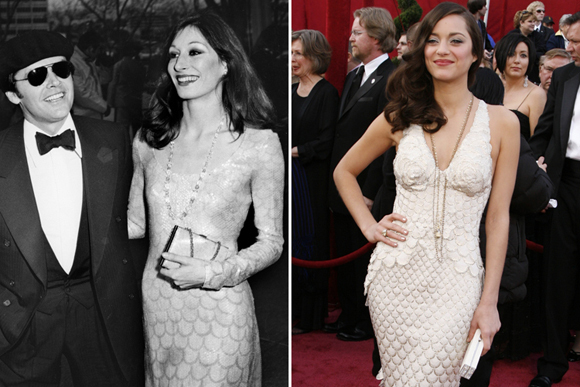 Huston's dress was likely by Halston, who was her friend, and she, his muse. Her look typified the American spirit of confidence, individualism and simplicity. Cotillard wore a Jean-Paul Gaultier Couture 2008 gown from the runway that was made in a custom color and fit based on her directives. Shifting perspectives: Lauren Hutton from the "fresh face of American fashion" to a face Hollywood notices for her performance in "The Gambler." Natalie Portman transitions from a child star to academy nominee for her role in "Closer." Portman wore a silk gauze Madame Gres-style pleated dress with gold waist and hip detail. Thirty years earlier, Hutton wore a dress that was most likely designed by her friend Halston, who called her "perhaps the greatest mannequin in history." Halston was at the height of his skills at this time, and the go-to designer. Here, lightly pleated chiffon dress with gold waistband cinches her waist to give her a flattering shape. Portman's dress is by Alber Elbaz for Lanvin, the "It" designer of the time. The classic silhouette is just as fluent 30 years later. Jeffrey Monteiro, a New York-based designer, has worked as the design director for Mayle, Derek Lam, Tod's RTW collection, and Bill Blass.